This is the first of a series of short articles highlighting some of the evidence of the ownership of the most fought over piece of real estate in the whole world: Israel. "Bear in mind the words of Moses to his people [the Children of Israel]. He said: 'Remember, my people, the favour which God has bestowed upon you. He [Allah] has raised up prophets among you, made you kings, and given you that [the Torah and the Land of Israel] which He has given to no other nation. Enter, my people, the holy land [of Israel] which God has assigned for you. Do not turn back, and thus lose all.'" Sura 5:20, "The Table"
Of course, the Jews do not own the Holy Land because of some words spoken by Muhammad some 600 years after Christ. No, ownership of the Land is clearly proven, not just by the land titles held by Israelis, but also by international law, history, archaeology, and possibly the oldest documentary evidence held by any landowner: the 3,600 year old Bible. In the pages of the Bible we read about the kings of Israel and of their prophets and leaders. We read about their battles to conquer the land of Canaan, both their losses as well as their victories. 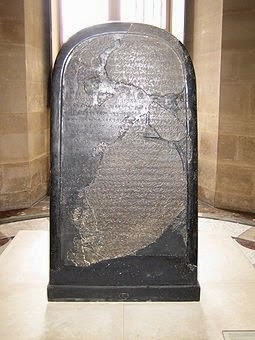 Below is a photo of the Moabite Stone, also known as the Mesha Stele, dated to around 830 BC. Line 5 the king of Israel, and he humbled Moab for many years (days), for Chemosh was angry with his land. The references to "the king of Israel," "the vessels of Yahweh" and "the House of David" help to establish the veracity of the Bible account of the existence of the kingdom of Israel, the House of David, and the name of the God of Israel, Yahweh. Other bits also affirm truths found in the Bible such as the names of Omri, king of Israel, and Chemosh, god of the Moabites, as well. 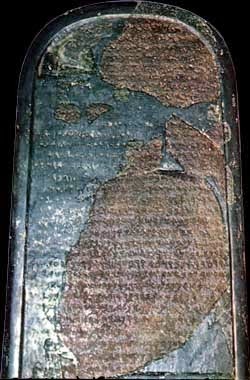 The Mesha Stele is one of many proofs of the ancient Israeli claim to the Holy Land and of the historicity of King David and the kingdom of Israel. While the House of David, Israel and their God Yahweh are mentioned, we find nothing to support the Islamic claim of a god named Allah or of Muslims from that era, simply because Muhammad had yet to invent Islam. And the Moabite Stone is proof that the Land has belonged to Israel and the Jews for millennia, not mere decades. Line 7 "But I triumphed over him and over his house, and Israel has perished; it has perished forever!" Unfortunately for him, King Mesha, the Moabites and their god Chemosh are now all gone, but Israel is back in its Land and stronger than ever. So much for those who try to destroy God's Chosen People! "I will restore the fortunes of My people Israel. make gardens and eat their produce. from the land I have given them. Yahweh your God has spoken."